Tola Wewe was born in Okitipupa, Ondo State, Nigeria in 1959. He trained and graduated with a degree in Fine Art from the University of Ife in 1983. He then went on to obtain a Masters degree in African Visual Arts from University of Ibadan, Oyo State in 1986. Tola Wewe worked as a cartoonist before becoming a full time studio artist in 1991. During the early years of his career, three major influences characterised Tola Wewe's works: the first was his basic academic training at Ife, the second his masters research programme in the Ijaw water spirit mask and thirdly society - particularly the Yoruba society. His style draws from the Ona symbols of the Yoruba and his themes project traditional lore and myths of his native Yoruba culture. Wewe describes himself more as a witness than an author, "communicating with the spirits of the ancestors, and drawing out the invisible spirits - the anjonnu, emere and the ebora - who make the art works…I am the vehicle, and they are the drivers. We go on these strange journeys to the most remote ends of imaginative experience." His work, defiant of classification, 'silently grows on viewers, blending with their moods, simultaneously taking their minds to strange and familiar colourful places full of false nostalgia. Often the attraction is mutual and instant: for those who can consume the spectacular banquet of colours, Wewe cooks up spicy visual rhythms, sometimes playful, sometimes serious, sometimes dense, sometimes scattered, carefully orchestrated, although seemingly extravagant.' (Moyo Okediji, University of Colorado). Tola Wewe is a founding member of the Ona movement, which emerged in February 1989. The movement is a group of scholars, critics and practising artists committed to pursuing artistic excellence through the adaptation and interpretation of traditional materials & methods, forms & styles of contemporary Yoruba art and design. Tola Wewe, whose works are widely acclaimed for their originality, simplicity, surface texture and mastery of colours, is considered one of the most talented minds from the African continent. His work is a hybrid of African and western sensibilities and images, reflecting his own training and experience as an international artist. Beyond Nigeria, Tola Wewe's works have been exhibited across Europe and the US. 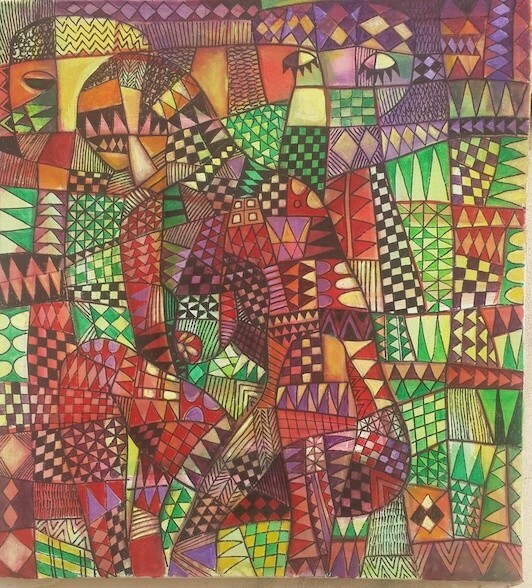 As a full time artist, he lives and works in Ondo State, Nigeria.